Give Music. Give Joy. Give Opportunity. 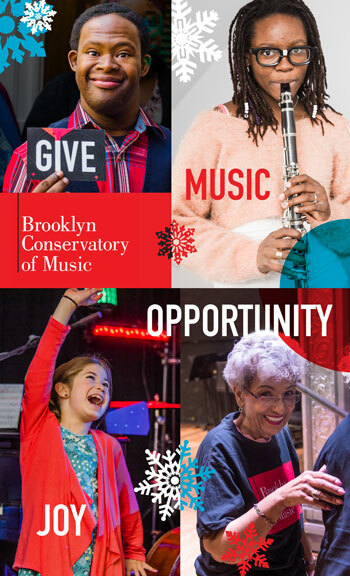 This holiday season, please consider supporting the Brooklyn Conservatory of Music. Your donation brings music to the lives of thousands. We teach music in the classroom to 4,500 public school students across four boroughs who would otherwise get no music education. We bring clinical music therapy to more than 1,700 kids and adults with special needs. We provide excellent, lifelong music education to over 800 students — ages 6 months to 104 years old — at our historic home in Park Slope. Many of our programs are free to our students. All of our programs are supported by fundraising. YOUR CONTRIBUTIONS DIRECTLY IMPACT THE LIVES OF THESE STUDENTS. Corporate partners are a crucial part of our organization, and strengthen the work we do in our communities. In addition to sponsoring BKCM events, corporations fund grants for educational programs, facilitate employee volunteer programs for special projects, and their members serve on our board and advisory council. BKCM relies on private and community foundation support for our stability, growth, and success. Grants and foundations can support our general operations, or can be directed to specific programs and activities, such as free or sliding-scale tuition for low-income students, professional development for faculty, or capital improvements for our facilities.